Coaching the next generation to be innovative leaders. Leadership is like charity it begins at home. How well you can lead yourself impacts how well you can lead others. 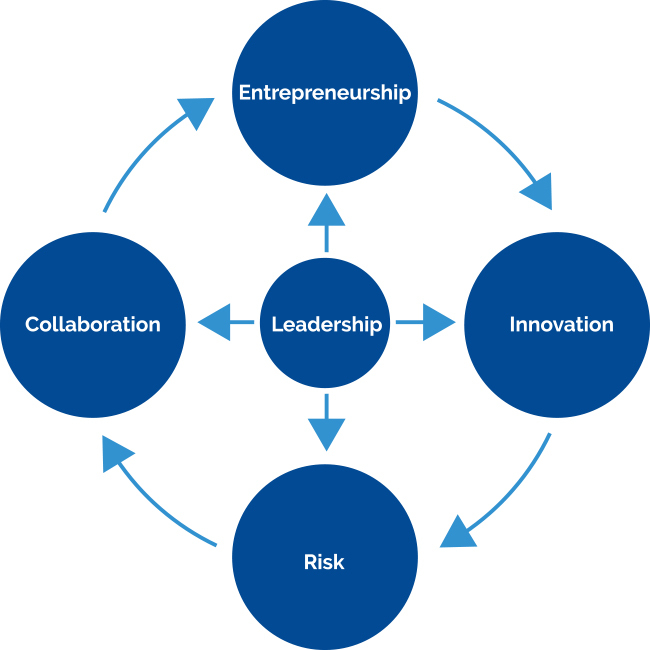 Innovation is essential for organisations to reinvent and reposition themselves. It’s also how we renew ourselves as people. Developing an entrepreneurial mindset is a learnable skill: vital if you want people to be generative and committed. Are You Fostering Entrepreneurial Leadership? Collaboration is good for people, passion and profits. It neutralises disengagement and enables us to achieve more than we ever could on our own. How Good Are You as a Collaborative Leader? The Risk Continuum goes from risk aversion through risk avoidance to risk awareness. Each triggers different parts of the brain. Learn which works best when. And how to trigger each. We work with organisations around the world. We give people the skills to innovate their own solutions. We deliver tailored programmes for real and lasting change from the C-Suite down. We provide bespoke coaching, training and advisory input. Having the right how-to’s in these 5 key areas of business will ultimately determine the future you create for your business, your clients and your colleagues. Delivering practical how-to’s requires field testing what really works. That’s why it matters that ITS has thirty years of successful consulting, coaching and advisory work. We also need to have some idea about why things work. That’s why we are at the cutting edge of the neuroscience revolution that is changing the way individuals, teams and organisations can maximise performance. Ian McDermott brings the rare gift of hearing the people in a corporation as he listens to them. Skilfully working with what he is hearing, Ian then helps companies transform quickly and lastingly, and, most importantly, he enables them to do it their way. Ian is very low key and very high impact - I highly recommend his artful work.